Yesterday we talked about what to pack. I always have a back-up bag in my car to help our trips and outings run smoothly. It’s a life saver and more than once I have been incredibly grateful that we have the stash. Today, I’m going to run down a few different techniques and tips for packing. This will maximize your space and ease multiple stops. – Clothes. Roll those babies. If you’re careful, you can roll them with very few wrinkles, fewer than if you fold them for sure. You will be able to pack more into less space if you roll. My hubby is 6-foot-3. His clothes are big. They take up lots of space. 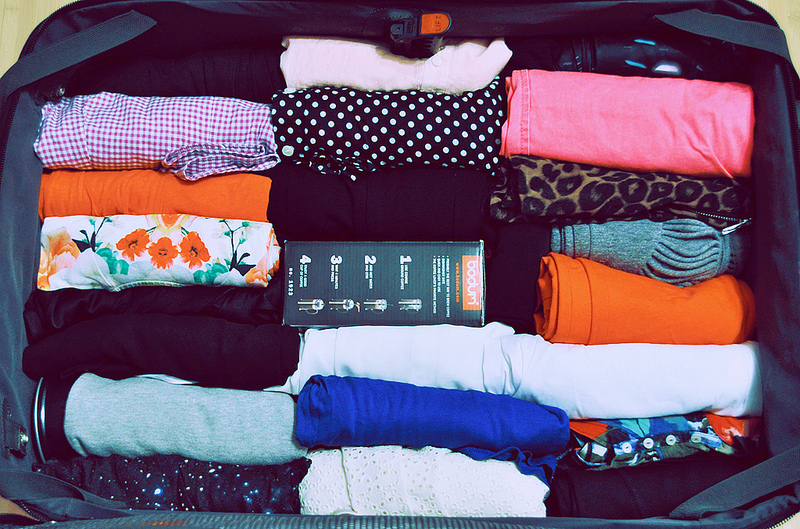 By rolling our clothes, we can still share a single – albeit somewhat large – suitcase. – Shoes. Stack pairs of shoes, with the soles together. Then alternate heels and toes so that you stack the heels of one set on the toes of another set. You can stack shoes in a suitcase with your clothing and not have to worry about dirty soles marking up your clothes before you’ve worn them. You can also put your shoes in plastic grocery sacks to keep the soles off your clothing. – Toiletry Items. Package liquids in zip top bags. Same with toothpaste or anything else you don’t want to clean up if it spills. Keep your toothbrush in it’s own baggy to eliminate the need for a toothbrush cover. Mr. Napping keeps an M&M’s mini tube to hold Q-tips. I bought a small travel pack of Q-tips once and just refill the pack every time we travel. Pack feminine hygiene products in a plastic-lined, small cosmetics pouch for privacy, easy access and a water-resistant case. You can easily take your bag of supplies to the restroom without everyone knowing just what little secrets you’re carrying. – Hair Stuffs. Get empty, travel-size bottles for your styling products. There is no reason to take more than you’ll need. Smaller bottles are easier to pack, lighter to carry and conserve that precious space. I use a Bracelet Box to hold a few claw clips, some bobby pins and rubber bands. Give up your gigantic brush and get a travel-friendly sized brush for the road. Don’t give up features you like, just think small. Consider a curling iron/flat iron combo and a travel-size hair dryer. This isn’t the exact box I use, but this 2 pack on Amazon would totally work. – Medication. I use small plastic bags (like those used in jewelry making), labeled with water-proofed labels (a Post-It with packing tape over the top) for my pills. I include the name of the medication, dosage instructions, and any other pertinent info. All the baggies get stored in a bigger baggie. Liquid medications are kept in their original containers. Most of our liquid meds are for our kids and if we need them, we usually need them for several days. Those are the one things I would rather have and not need, than need and not have. Our kids almost always seem to get some kind of bug when we travel though. – Food. I pack small, soft sided lunch bags with fruit slices and cheese. Much better snacks than sweets. I found small, plastic thermos-style bottles at Michael’s for $1.50/each. I got one for each of my boys and they were perfect. I saw similar bottles at Wal-Mart today as well, back in the baby section with the other kid’s eating supplies. These were the perfect size for little hands – bigger than a juice box (and filled with water instead of sugary juice) but not so big and heavy that their little hands can’t handle them. We usually clean out the fridge and take a cooler with us too. I pack dry snacks (like cereal, granola bars, beef jerky, nilla wafers and animal crackers, popcorn, ect) in zippy bags. I swear by these Munchkin Snack Catchers . They don’t eliminate all mess, but they sure help keep it under control. Follow the link to get them on Amazon or I’ve found them at Wal-Mart, also in the kid’s food supplies. I can fill the snack traps as my boys empty them. This serves two purposes. I can monitor how much they are eating and, if they do spill, it’s a limited amount. Which also means we don’t lose the whole bag of snacks when Gator dumps it in his car seat. – Kid’s Entertainment. I will go more in-depth with this in a couple days. You have got to have things for your kids to do. It’s hard to sit still, especially if you’re strapped down for hours and hours and hours and hours. Right? Whether you choose to go the electronic route of in-trip entertainment, the more conventional method or a combination of both, everyone will be happier if you take the time to plan some fun and a few distractions. Did I miss anything…? What are your tips and tricks for packing? If you are making multiple stops, like we did on our last trip, it can be helpful to pack for each place you’ll be stopping. That way you will minimize the amount of baggage you have to take inside. What you don’t need or have already used can be left in the car and cycled so it’s out of the way. This will, however, usually require more bags, so if space is the bigger issue this method may not work as well. Join the newsletter for exclusive content and giveaways!